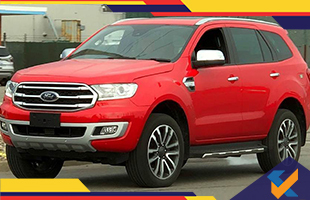 IBB Blog : Facelifted Ford Endeavour coming in 2019? Facelifted Ford Endeavour coming in 2019? The facelifted Ford Endeavour SUV is expected to arrive in the Indian market in 2019. The new Endeavour will be globally facelifted sometime this year and this will arrive on Indian shores in early 2019 according to reports. The front fascia will sport a new octagonal radiator grille in tandem with the lower air intake getting a silver frame and three chrome slats which are horizontal. There will also be brand new 20-inch six-double-spoke alloy wheels. The facelifted Ford Endeavour (sold as the Everest globally) will also get engine start-stop, something that may or may not come to India. It will also get passive keyless entry. Globally, there will be the new TDCi 2.0 litre and TDCi Bi-Turbo 2.0 litre diesel engines introduced for the car along with a new 10-speed automatic transmission unit. However, the Indian market will not get any of these new offerings as per reports. Instead, the current 2.2 litre and 3.2 litre TDCi diesel engines will be retained for the facelifted Ford Endeavour. The former presently makes 160 PS and 385 Nm and power and torque figures should go down by 10 PS and 10 Nm respectively according to reports. The latter will continue to make 200 PS and 470 Nm of peak torque. The prices for the 2019 Endeavour may start from around Rs. 27 lakhs (ex-showroom) as per reports.